Los Altos, CA Ukulele Lessons Near Me | Fun Classes. Top Teachers. Check out some of our most popular teachers near Los Altos, CA including San Jose, Sunnyvale, Palo Alto, Mountain View and Santa Clara. Students learn note reading, chord voicings and more! I teach beginners and intermediate students how to get around on the ukulele and have fun playing songs they want to learn. Beginning ukulele students will be taught the basics in a fun but productive way. I will teach a strong foundation so a student can move forward with confidence. Lessons would be individualized to focus on areas that need the most guidance. 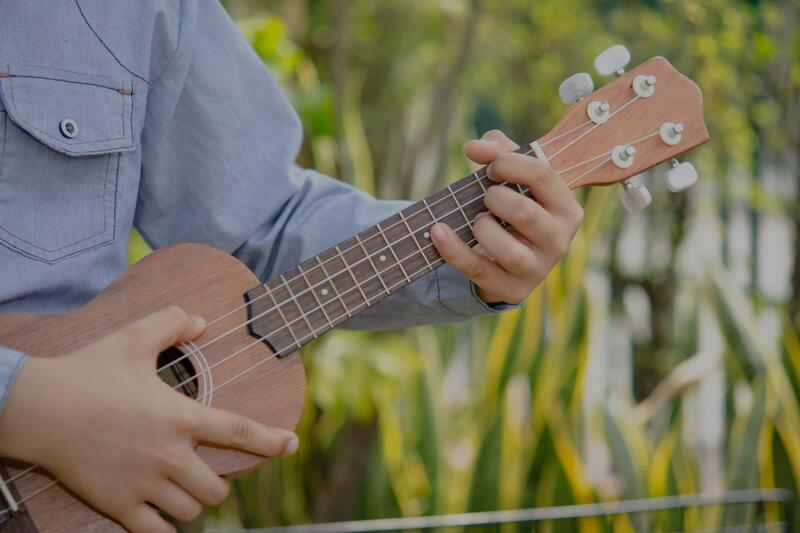 You will learn the basics about rhythm, harmony, and melody and how they apply to ukulele. You will become fluent in the 12 basic keys to a degree where you can play simple songs in any of them. "Showing the world there are more songs to play on the uke besides Somewhere Over the Rainbow, I'm Yours, & Riptide." I have played ukulele for 9 years and spent 3 years in college singing & playing on State Street in Santa Barbara. My teaching style focuses on using tab notation. I think it allows players to be more creative in altering chords & progressions, instead of defaulting to basic ones like "G, D, Am, C."
I still start with basics (depending on experience level) but eventually I move on to unique chords, strumming/percussive patterns, & embellishments that turn the ukulele from a "toy" into a powerful instrument. I am a singer that took on the ukulele 8 years ago. Over the past 3 years I have played throughout Santa Barbara performing local gigs & busking on State Street. I like to challenge the preconception that the ukulele is a "toy" and expose people to what can be achieved on a small, 4-stringed instrument. I am constantly thinking of new ways to add life to the instrument and show how capable the ukulele truly is. My goal is to make all of my students reach the point where they are comfortable with their own voice. My teaching draws from my experience in formal concert/chamber choirs, musical theatre, collegiate a cappella, and solo performances. In addition to teaching, I create videos as an outlet for performing and sharing my true enjoyment for music. We have had Nico as our instructor for almost a year. He's an amazing musician that can actually teach. He brings sheet music & his own tabs to each lesson. Overall a fun, knowledgeable teacher who knows how to work with kids. If your looking for a ukulele teacher I highly recommend Nico! He’s been coming to our home once a week for 4 months now to teach my 9year ukulele. Since then she has learned to play various songs. When not taking a lesson, she knows what to work on till next lesson. Nico is friendly, patient, and a very talented musician. Nico is truly terrific! I highly recommend him. Nico has been my singing coach for the past couple months and I look forward to many more months with him. He is full of encouraging positive energy. He creates a comfortable learning environment. Nico provides friendly constructive feedback. He’s fun and relaxed, yet structured and on time. He plans his sessions in advance and is prepared for each lesson. He’s open to input from the student to ensure he’s delivering what the student wants. Nico sends a follow-up email after each lesson, which includes helpful tips. Nico himself is very talented at singing and he knows how to teach! Nico is dependable — he’s never missed a scheduled session with me. And he is flexible if there is a need for me to reschedule. I feel like he truly cares about his student and he has a passion for sharing his deep joy and life-long experience and knowledge with music. I feel fortunate to have found Nico and to have him as my teacher and I think you would be glad to have him be your teacher too. Can't find a teacher in Los Altos, CA? "Melissa was very friendly. I like her teaching style which she told us some theory. This made me get better understanding,"
San Jose, CA teacher: Melissa M.
erstand the first time. He uses my favorite songs to teach me new skills. He also takes time to find other songs for me to play. He urges me to do my best, and not to be afraid to make mistakes. I have learned a great deal about music and can hardly wait to go to my lessons!" "Melissa was great. Thank you Melissa." "Jess is dedicated, patient, and confident teacher!!! hat he lives for music and it's not just a job for him teaching students. He is determined but patient with the kid and really has educational skills." e. I appreciate his clear, concise, and congenial approach — serious, mindful, and leisurely." trating on whatever is giving me issues that week. I love that he customizes your musical goals: I will never be Jake Shimabukuro, but I will be able to play along the next time someone says "California Dreamin' in G". I definitely recommend Jess to all the old ladies that want to learn an instrument - and everyone else! Next stop....bass guitar!" eory as well as chord development... I'm hoping to join a ukelele club to see where I stand! Thanks, Jesse!,"